Little Rock. Ark. Aug. 16. 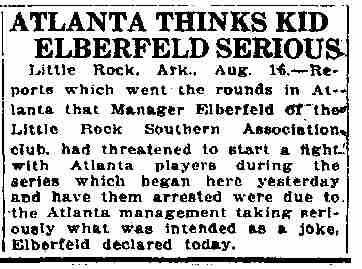 - Reports which went the rounds in Atlanta that Manager Elberfeld of the Little Rock Southern Association club, had threatened to start a fight with Atlanta players during the series which began here yesterday and have them arrested were due to the Atlanta management taking seriously what was intended as a joke, Elberfeld declared today.